The bike shed, as we say over here John . . . est manifique! Yet another fitting cameo for Granby. As a proud custodian of an old Austin 7, I also applaud the thought of the shop foreman rolling up to work in one. Winter is finally setting in again in the Loire and I'm turning back to my railway projects once more and enjoying the ever forward progress of your layout. 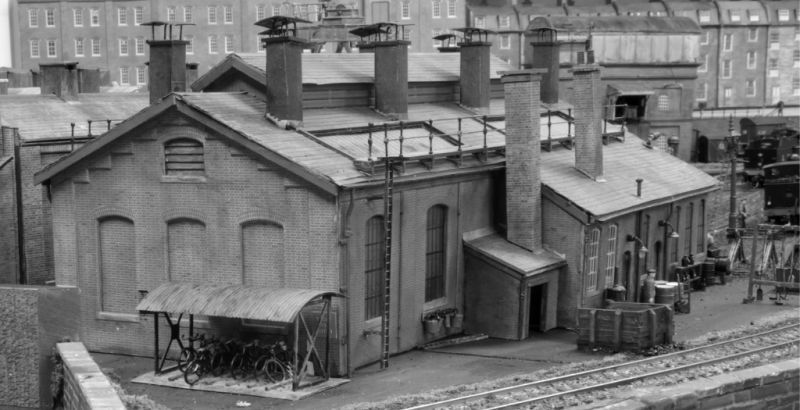 Longchap wrote: The bike shed, as we say over here John . . . est manifique! Yet another fitting cameo for Granby. Thanks Bill......glad you like it. 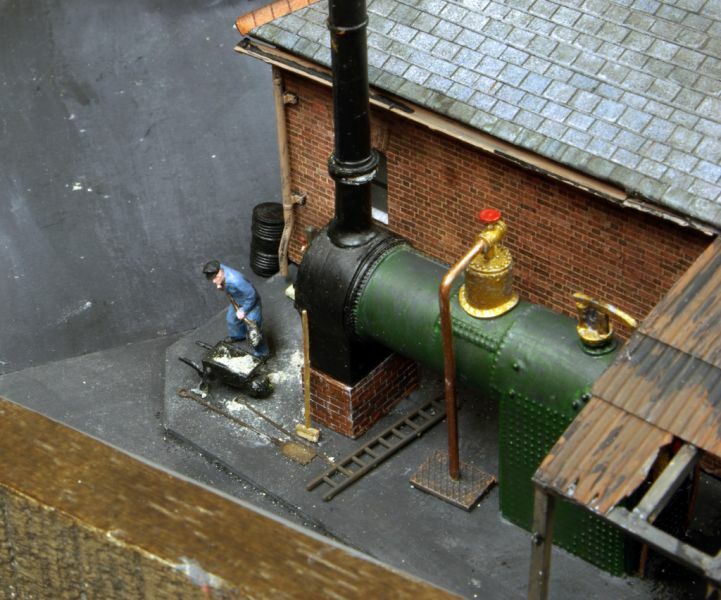 Someone on another forum asked how I made the "concrete" that surrounds the Engine Shed. I use artist's mount board (we call it Mat board). If you are not bothered about colour, and clearly I am not , you can pick up off cuts quite inexpensively from Picture Frame shops. The coloured side generally has light texturing, which can be useful, the underside is white and smooth. To get it to Code 100 rail height I use two layers. 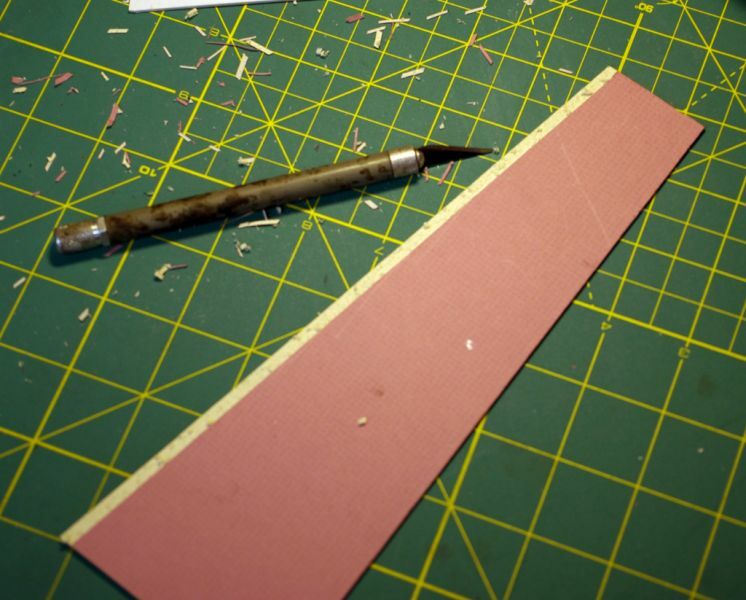 The bottom layer is just roughly placed but the top layer is cut precisely to make a snug fit. 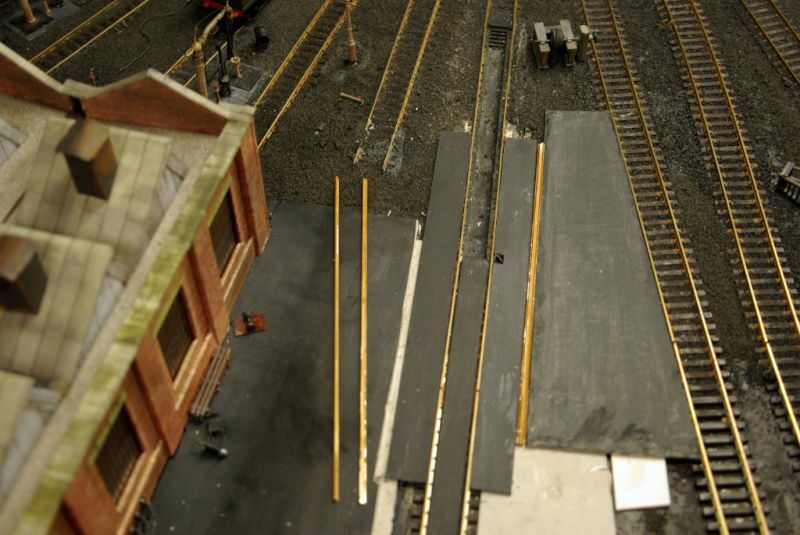 This is the reverse of a section to go between two sidings. The strip on the left has been scraped off the surface with a scalpel to allow for the height of the rail chairs. Infill rising above rail height was the bane of my life on the old shed so I am somewhat cautios . After a few coats of randomly mixed Black and Grey Acrylic. The wheel drop rails are made of two sections of Code 100 glued to form a U channel. 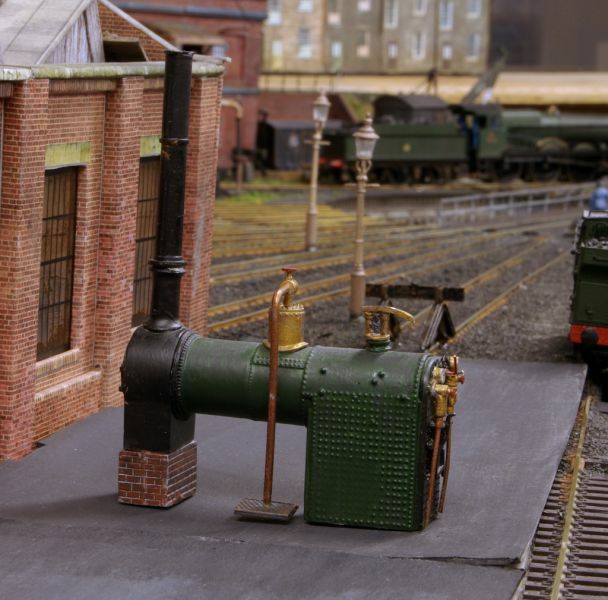 There should be an inspection pit infront of every shed road but when I first built the shed I chickened out, reasoning they woud mostly be covered by locos. Good job that I did of, course because when I changed the turntable the exit road geometry changed. I find it difficult to set up convincing everyday cameos on the shed roads. 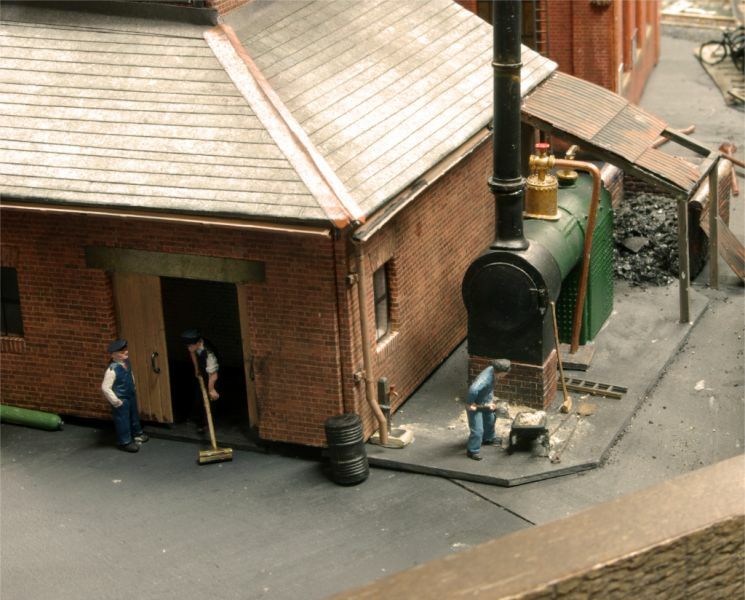 The realistic scene of a Driver oiling a bearing or a cleaner polishing a tender look a bit daft when the said loco moves off shed! 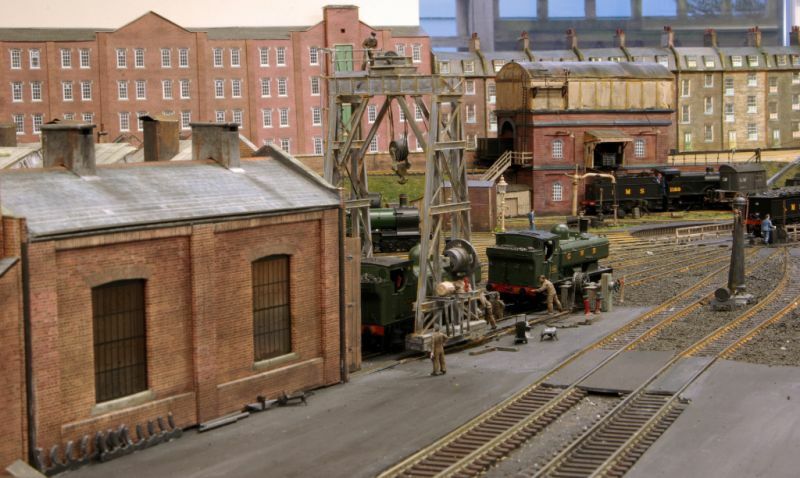 As an alternative I have set up a couple of static cameos where the locos will not move (in truth...they cant)....the active shed roads just have equipment and a few staff walking purposefully. So here is the first such cameo. A very nice cameo scene John. As usual, a great scene that really looks the part. 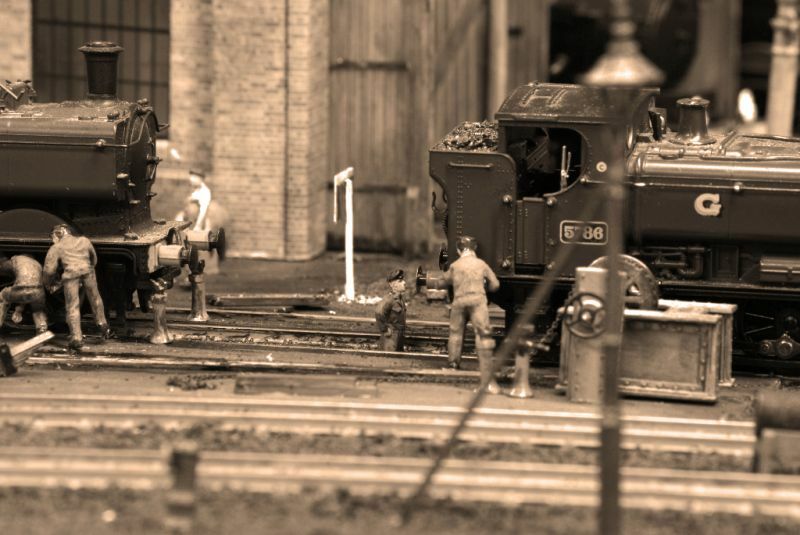 The cameo scenes certainly make all the difference and are an inspiration to any modeller for sure. As with most things it's where do you stop (or how much can you get away with spending). 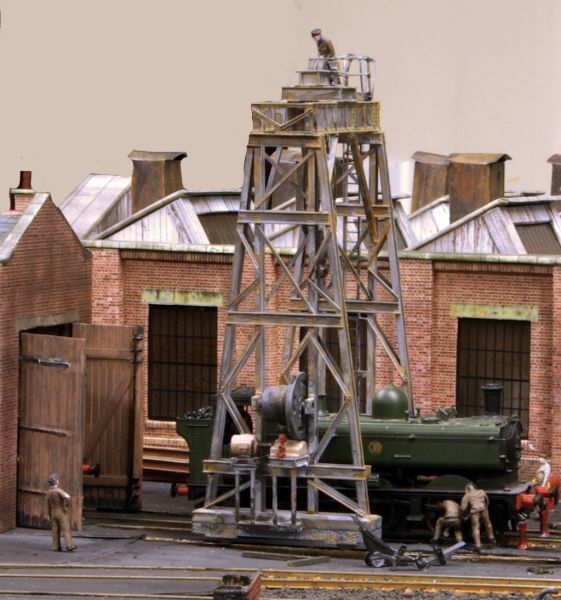 The DCC Concepts point rodding is a case in point - just when you've decided on where the line should be drawn something else comes along. I guess that's why a layout is never finished - there is always that new product or other bit that you have always wanted to do. Keep them ideas and pictures coming though! I started reading from your very first post yestetday, as I was looking for a track plan, to see how worried to be with my new railway room location. The overall sizes are spookilly similar. It may take me some time. Brilliant!!! Nice to see the shed staff dressed in summat other than generic blue coveralls! DaveH_Murcia wrote: As usual, a great scene that really looks the part. 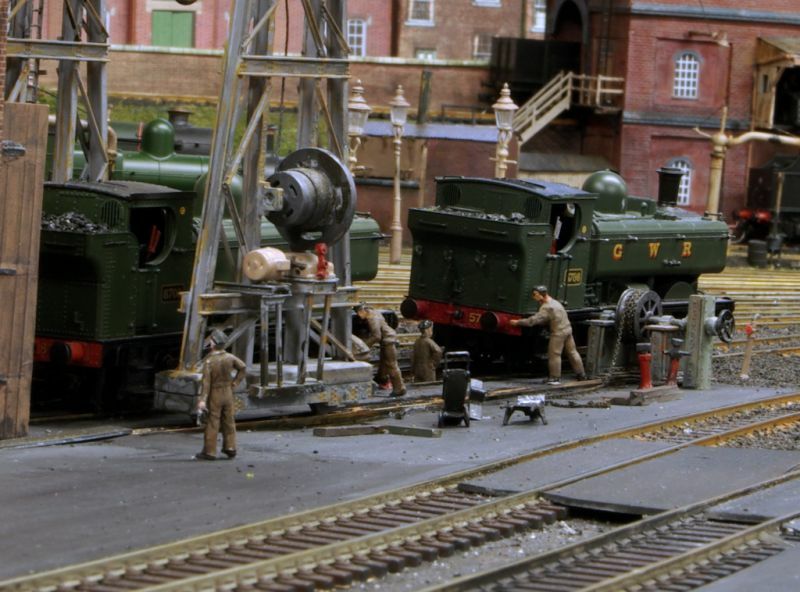 The cameo scenes certainly make all the difference and are an inspiration to any modeller for sure. As with most things it's where do you stop (or how much can you get away with spending). The DCC Concepts point rodding is a case in point - just when you've decided on where the line should be drawn something else comes along. I guess that's why a layout is never finished - there is always that new product or other bit that you have always wanted to do. Keep them ideas and pictures coming though! 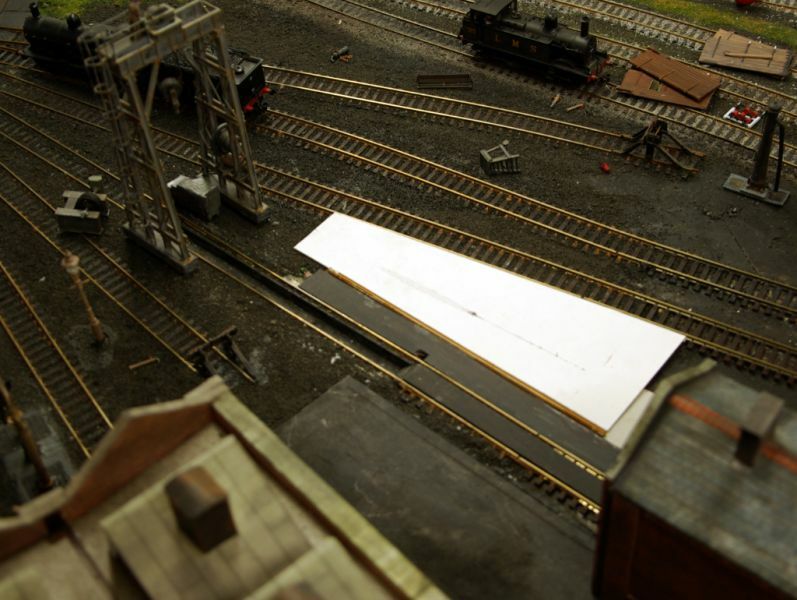 Thanks Dave....... glad you like the cameos.......I guess doing the scenery on your layout is going to be a huge job! I do wish I had taken your approach which is similar to Brian's, namely completely finish the track before adding any permanent scenery. I was too impatient and "scenicked" in stages.....in consequence I have probably taken twice as long! My line in the sand was working signals. 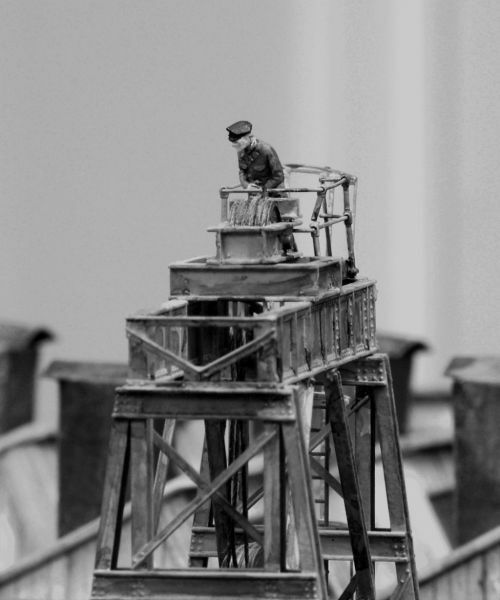 I decided that because I could only have semaphores in 1948 that was a step too far and beyond my modelling capabilty. Its a pity and I am still tempted to put a Dapol one on the branch. Point rodding, even cosmetic, is definitely out for me. 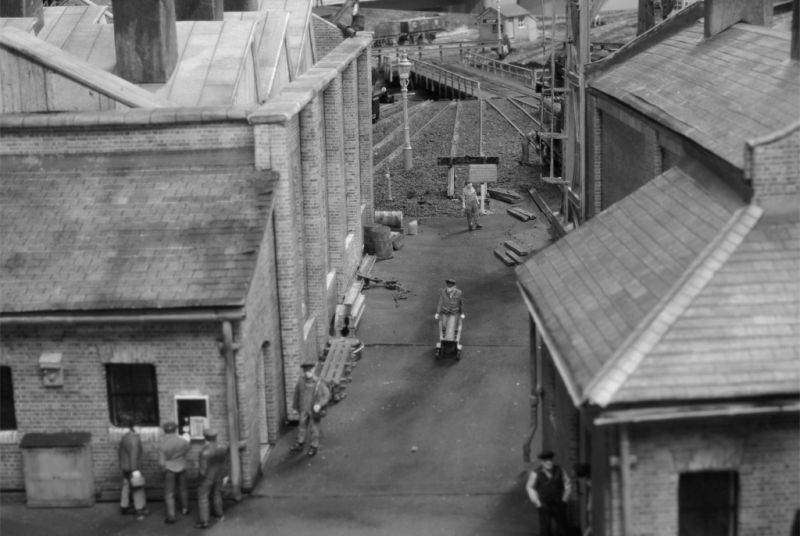 Although the layout, which is now 11 years in the making, is largely finished there are still three major scenes/buildings to be constructed. Just never seem to find enough time! The overall sizes are spookilly similar. It may take me some time. Brilliamt!!! I dont think I ever published a track plan. I wil take a couple of screen shots of the RR&Co switchboard which shows the layout in schematic form. I doubt if you would want to follow my plan although it would help you avoid some of the more glaring errors that I made. Happy to provide my top ten list of things I wish I had done differently. Chubber wrote: Nice to see the shed staff dressed in summat other than generic blue coveralls! It's okay, I don't need a track plan specifically, as I found what I was looking for with the size of your railway room. I've been slowly restoring my garage / workshop over the past couple of months and with some rationalisation of the cars, I've easily space for a 6 x 3 metre railway room at one end. I was trying to imagine what scale of railway might fit into the space and I'm pleased that the result will keep me entertained for quite a long time. I'll pick up on my ideas on a separate thread, but your work and those of others here, are truly inspirational. John, the first Brunel era footplate men wore white courduroy coveralls! Given you era, I'm sure lots of de-mob faded khaki overalls [like those worn by my stepfather to do messy jobs] would have been pressed into service. 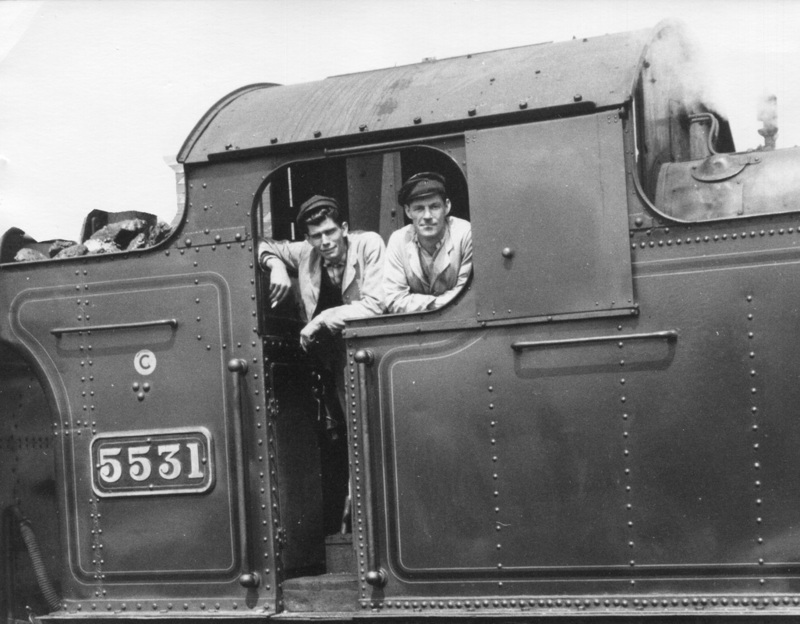 Chubber wrote: John, the first Brunel era footplate men wore white courduroy coveralls! Oops .......sorry Doug I meant to reply earlier. So what is the colour? The link is black and white........or am I just being slow? In any event you guys must be getting fed up with shots like this. 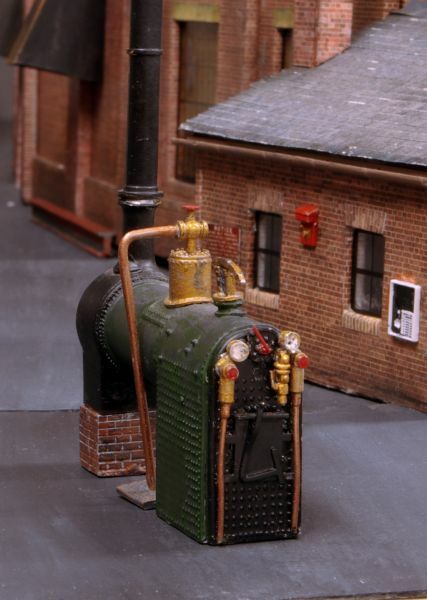 A steam boiler for the workshop. It came in kit form as part of a job lot of Gem items that I bought years ago. I am not sure that it would have been located outside or that it would have been kept in such pristine condition. I suppose I can create some sort of legend about a shed pet, lovingly maintained by Bill Longshank a semi retired ex driver. Bill craftily knocked up a shelter where he can spend most of his time. Fortunately he hasnt got around to replacing the corrugated sheet that rusted away.......so I can continue to admire the backhead detail. As good as all the other pic's are, that first B & W, looking between the buildings to the TT really is the one.